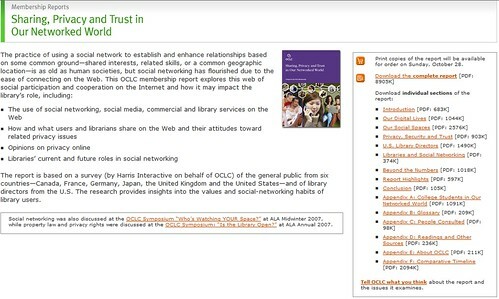 It’s taken a long time for them to release this, but OCLC has finally made their Sharing, Privacy and Trust in Our Networked World report available for free on the web. I’ve heard OCLC staff say they don’t believe they asked the right questions for some of the topics, which I agree with, so I think we have to take the data with the proverbial grain of salt. You’ll be able to order a 280-page paper copy starting October 28, which is how I’ll read this if I can get my hands on a copy. I couldn’t totally resist, though, so I did jump ahead to the conclusion (PDF) and already I’m intrigued. “In the 18 months since the publication of the Perceptions of Libraries and Information Resources report, the use of search engines and e-mail has grown by more than 20% over what were already enormous participation levels. User participation in basic Internet services, such as searching and e-mailing, is approaching total participation. More than twice as many respondents are using blogs now as then…. Internet use has not simply increased, it has infiltrated our lives, offering more and more services at more and more service points. Use has grown for almost every Internet service we measured in this surveyâ€”well, almost every service. On the social Web, the library brand must go from institutional to personal…. The social Web is not being built by augmenting traditional Web sites with new tools. And a social library will not be created by implementing a list of social software features on our current sites. The social Web is being created by opening the doors to the production of the Web, dismantling the current structures and inviting users in to create their content and establish new rules. Open the library doors, invite mass participation by users and relax the rules of privacy. It will be messy. The rules of the new social Web are messy. The rules of the new social library will be equally messy. But mass participation and a little chaos often create the most exciting venues for collaboration, creativity, community buildingâ€”and transformation. It is right on mission…. Now, I give full credit to OCLC for running, analyzing, and publishing (especially freely) this report (I so wish MPOW published this kind of wonderful data this freely), but I have to dock them points for the way they invite feedback on this report. On social networking. And sharing online. And privacy concerns. Where do the points come off? The only way to submit feedback is via a form that has your name and email address as required fields and which sends the message off into the ether instead of posting it online. No discussion at all on the report’s site. Given the social efforts OCLC is making elsewhere (WorldCat, WebJunction, etc. ), I have to believe they have something in the works that just wasn’t ready yet, but this certainly does fill the belly of the irony beast. Update: And indeed, the online community is now live via open comments on what appears to be a blog. Discuss away. I thought it was interesting that out of 4,000 postcards mailed to U.S. librarians, only 382 completed the survey. Of course, I realize this is fairly typical for survey response…. “Open the library doors, invite mass participation by users and relax the rules of privacy.” LOL… We would need a PSA! NOTICE: WE BELIEVE INFORMED DECISIONS ARE MADE ONLY WHEN FULL-DISCLOSURE IS PROVIDED. SUBSEQUENTLY, IF YOU ELECT TO PARTICIPATE IN THIS AMAZING NEW SERVICE, ANY INFORMATION THAT YOU SHARE MIGHT BE USED AGAINST YOU. WE HIGHLY ENCOURAGE YOU TO JOIN IMMEDIATELY! Yes, the commenting page for the report is live. I commented on this OCLC report and asked for more information about “Online Activities” by age. They answered my question and even posted an additional pdf with a chart of “Online Activities by Age”! I really appreciate that the staff at OCLC went to the trouble of making this data public.